Eurowindoor: RSS-Feed http://www.eurowindoor.eu/ The official Eurowindoor News RSS channel en Fri, 19 Apr 2019 13:04:57 +0000 Fri, 19 Apr 2019 13:04:57 +0000 TYPO3 news-352 Tue, 12 Feb 2019 13:20:00 +0000 EuroWindoor published the position on RoHS II for windows and doors with electrical equipment depending from route of distribution http://www.eurowindoor.eu/index.php?id=1104&tx_news_pi1%5Bnews%5D=352&tx_news_pi1%5Bcontroller%5D=News&tx_news_pi1%5Baction%5D=detail&cHash=cd75e6b0b664ca9779d711328054a509 In July 2019 RoHS Directive 2011/65/EU will come into force for construction products with electrical devices. Even it is not written in the directive that the complete window or door with electrical device will become an electrical equipment, construction products shall belong to category 11 (“Other EEE not covered by any of the categories”) as the EU Commission states in the FAQ. EuroWindoor detected some problems by implementing the RoHS requirements because of different procedures and responsibilities of installing electrical devices to windows and doors resulting in different requirements for the products. Only if the electrical devices are included before the complete product is placed on the market, the RoHS requirements do apply to the complete construction product. More often the electrical devices are installed after the construction product is placed on the marked. Then the window or door complies with CPR / REACH and the electrical devices with RoHS. In the position paper EuroWindoor explains the different RoHS requirements for windows and doors with electrical devives depending from route of distribution with a motor lock for a door as example. EuroWindoor suggests to limit the scope to the electrical device of the window/door, something that could be done by clarifying the definition of large scale fixed installations. Windows and doors are normally assembled and installed by professionals and will stay in the building for 40+ years whereas an electrical device itself typically will be replaced 2 to 3 times during this period. The presentations by the daylight standardisation experts Prof. Marc Fontoynont, renowned German light planner Prof. Peter Andres as well as Markus Broich from the Bundesverband Flachglas (Federal Flat Glass Association) and Ferdinand Friedrichs from the Verband Fenster + Fassade (Window and Curtain Walling Manufacturers’ Association) highlighted, partly proven by empirical research, the full significance of daylight in buildings as well as the latest draft standards. On the morning of 24 October 2018, EuroWindoor presented the findings of the EuroWindoor study on the use of windows and external doors out of wood once they are no longer in use (End-of-Life Treatment). According to this, in Europe more than 50 per cent of the wood of these elements does not go to landfill, as outlined in the European draft standard for the compilation of environmental product declarations but into thermal recovery (incineration) or recycling. In his presentation on the study findings, David McKinnon from the Danish consultancy Ramboll, emphasised that the European Committee for Standardisation CEN has amended the final draft of EN 17213 “Windows and Doors – Environmental Product Declarations – Product Category Rules for Windows and Doors” accordingly. 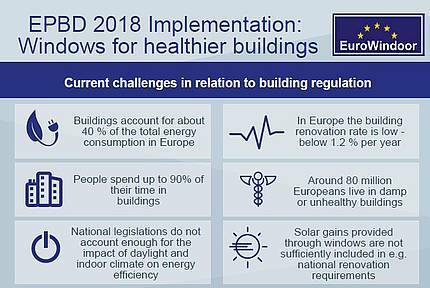 ]]> news-339 Fri, 09 Nov 2018 11:15:00 +0000 EuroWindoor published the position paper „The benefits of windows and glazed areas“ and the Infographic “EPBD 2018 Implementation: Windows for healthier buildings" as a contribution for implementation of the Energy Performance of Buildings Directive http://www.eurowindoor.eu/index.php?id=1104&tx_news_pi1%5Bnews%5D=339&tx_news_pi1%5Bcontroller%5D=News&tx_news_pi1%5Baction%5D=detail&cHash=b69703aa928e99ea50aad8fda9c43b9c Frankfurt am Main, November 9th, 2018. EuroWindoor AISBL as a strong supporter of the EPBD welcomes a more holistic approach recognizing the complementary potential of Energy efficiency, healthy indoor comfort and positive impacts on the environment. Of absolute importance is now implementation of the 2018-amended EPBD Directive into national legislation. ]]> news-338 Mon, 08 Oct 2018 13:20:00 +0000 EuroWindoor published the position on scoping the Ecodesign preparatory study for Building Automation and Control Systems (BACS) http://www.eurowindoor.eu/index.php?id=1104&tx_news_pi1%5Bnews%5D=338&tx_news_pi1%5Bcontroller%5D=News&tx_news_pi1%5Baction%5D=detail&cHash=2fd5e46bca83f54eac9a4b93114ab534 EuroWindoor took note of the Task report on scoping the Ecodesign preparatory study for Building Automation and Control Systems (BACS) in September 2018, decided to clarify important items for our sector and published in September 2018 the position on scoping the Ecodesign preparatory study for Building Automation and Control Systems (BACS). The Ecodesign preparatory study on Building Automation and Control Systems (BACS) implementing the Ecodesign Working Plan 2016-2019 has the aim to pursue climate targets and reduce CO2 emissions. The products of our sector are integrated into the building management system in a wide variety of ways, some of which are also operated as stand-alone actuators. We would like to highlight that the products are fundamentally different from e.g. heat generator control system”. The function of our products is of key relevance to reduce building energy consumption by changing the performance of the building shell when needed, e.g. by controlling solar gains for reducing heating or cooling energy, by allowing natural ventilation and night cooling to reduce the potential need for air-conditioning etc. There is no need to have a permanent operation and most of the time the products are in stand-by mode. In the Annex exemplary extrapolations of the energy consumption for various products is calculated. Energy consumption of active operation of the mentioned products is usually smaller than in stand-by mode. All energy consumption of the above mentioned products is far below the data of other consumers (such as artificial lightning, heating, cooling, …). The energy consumption of automatic sliding or revolving doors is higher than that of automated windows or shutters, but is due to more frequent use (inspection) and safety aspects (e.g. escape routes, fire protection). EuroWindoor proposes for reasons of e.g. no significant savings in self-consumption bearing in mind the proportionality of future possible measures not to take these BACS products under further consideration for potential product measures according to Ecodesign Directive (ED) and Energy Labelling Regulation (ELR) in the "Ecodesign preparatory study for Building Automation and Control Systems (BACS) implementing the Ecodesign Working Plan 2016-2019". Instead the Smart Readiness Indicator with its focus on e.g. energy and indoor climate, well-being and health aspects should be developed. Examples of energy consumption are shown in the annex of Position Paper. ]]> news-324 Wed, 22 Aug 2018 10:28:00 +0000 EuroWindoor presentation on the "glasstec": What happens to wooden windows and doors after the service life? http://www.eurowindoor.eu/index.php?id=1104&tx_news_pi1%5Bnews%5D=324&tx_news_pi1%5Bcontroller%5D=News&tx_news_pi1%5Baction%5D=detail&cHash=33e18a9f9bdc9f7b47561b82f46240ca On October 24th, 2018 EuroWindoor presents the results of the EuroWindoor study on how to deal with windows and doors made of wood after the service life ("end-of-life treatment") at the "glasstec" fair in Dusseldorf. The results are presented by David McKinnon of the international engineering and consulting company Ramboll that carried out the study. ]]> news-319 Tue, 21 Aug 2018 13:05:00 +0000 EuroWindoor Newsletter 08/2018 http://www.eurowindoor.eu/index.php?id=1104&tx_news_pi1%5Bnews%5D=319&tx_news_pi1%5Bcontroller%5D=News&tx_news_pi1%5Baction%5D=detail&cHash=026a8f47727d07779fb4f77c76368fe3 EuroWindoor AISBL gives an update on its activities in the Newsletter 08/2018. In the first half of 2018 we worked hard on our working program (Energy Efficiency, Health and Environment, Research and Education and CE-Marking and Standardisation) to improve the situation of our sector. ]]> news-322 Mon, 20 Aug 2018 10:28:00 +0000 EuroWindoor daylight conference during the „glasstec“ fair: The diverse benefits of daylight http://www.eurowindoor.eu/index.php?id=1104&tx_news_pi1%5Bnews%5D=322&tx_news_pi1%5Bcontroller%5D=News&tx_news_pi1%5Baction%5D=detail&cHash=d1956cf29d7461be1537f9ddb29b0582 On October 24th, 2018 EuroWindoor will host its conference “Daylight by EuroWindoor” during the „glasstec“ fair in Dusseldorf: Provision of Daylight in Buildings – state of the art and news about planning. That afternoon's event primarily appeals to architects and representatives of the window, façade and glass industry. It focuses on the new European standard EN 17037 for daylight in buildings that will be published in autumn in addition to new findings from daylight research and their skilful implementation in the planning process. Speakers of the conference are the daylight standardisation expert Prof. Marc Fontoynont, that teaches in Denmark, the renowned German lighting designer Prof. Peter Andres as well as experts from the Verband Fenster + Fassade (Window and Curtain Walling Manufacturers’ Association) and the Bundesverband Flachglas (Federal Flat Glass Association). The event "Daylight by EuroWindoor" will take place on October 24th, 2018 in context of the "glasstec" fair in Dusseldorf from 2 to 4 pm in hall 10, C18 - F18. There is a simultaneous translation in German and English. Participants can register for 49 € per person directly at the online ticket shop of the "glasstec". The ticket also entitles you to visit the fair. In the morning of the same day, October 24th, 2018, EuroWindoor also presents the results of the EuroWindoor study how to deal with windows and exterior doors made of wood after the end of life ("End-of-Life Treatment") in hall 10 from 11 am to 12.30 pm. "There is no additional charge for this event. You just need to register via EuroWindoor at gs @eurowindoor .eu with keywords "End-of-Life Treatment", your full name and company name", explains EuroWindoor General Secretary Frank Koos. “As that event also takes place at the exhibition centre, you need as well a fair ticket for getting access. We recommend to combine that with a "Daylight by EuroWindoor" ticket to join both events." ]]> news-297 Thu, 19 Apr 2018 10:28:00 +0000 EuroWindoor Study Tour 2018 in Germany http://www.eurowindoor.eu/index.php?id=1104&tx_news_pi1%5Bnews%5D=297&tx_news_pi1%5Bcontroller%5D=News&tx_news_pi1%5Baction%5D=detail&cHash=aa2154d128597e5f054da214d8035d7e The wider area of Berlin will be the destination of the EuroWindoor Study Tour 2018. From September 12th to 14th, 2018 two window manufacturer, a producer of PVC profiles for windows and a wholesaler of Timber will be visited. Different to previous Study Tours all materials of the sector will be considered now in the itinerary. The guidance of the Berliner Schloss, whose rebuilding is almost completed, will be the cultural highlight of this Study Tour. The high significance of window and facade construction in architecture can be illustrated very well at this building. After traveling to Finland in the region of Tampere in 2016, this time Berlin, Germany will be the destination. "EuroWindoor continues with the biennial organised study tours the long-term tradition of FEMIB, the association of European woodworking associations in the construction industry," said EuroWindoor Secretary General Frank Koos. "However, after FEMIB continues its activities in EuroWindoor AISBL since the re-foundation 2015, we are now opening this journey to companies of all materials. This is the only way to improve the exchange of knowledge between the individual material divisions in EuroWindoor and to develop our overall common interests in Europe to a greater extent and to represent them more convincingly on the outside". The EuroWindoor Study Tour 2018 can be booked for a fee of € 680 per participant until July 6th, 2018. Interested parties from EuroWindoor member groups can participate for the cheaper amount of 575,-- Euro. Per companion in a double room the travel price is 395,-- Euro. In addition to the visit program, the participation fee includes two overnight stays including breakfast and meals. Registration deadline is July 6th, 2018. More detailed travel information is available from Markus Christoffel of the EuroWindoor Secretariat in Frankfurt am Main. You can reach him by phone at +49 (69) 955054-36 or by e-mail at gs @eurowindoor .eu. ]]> news-298 Thu, 19 Apr 2018 10:15:00 +0000 EuroWindoor General Assembly in Nuremberg confirmed the Executive Board for another three years http://www.eurowindoor.eu/index.php?id=1104&tx_news_pi1%5Bnews%5D=298&tx_news_pi1%5Bcontroller%5D=News&tx_news_pi1%5Baction%5D=detail&cHash=b3f4be92b0d3f7ac885bfffd9f086b11 On March 20th, 2018, the day before the opening of the trade fair Fensterbau Frontale in Nuremberg, the previous Executive Board of EuroWindoor was unanimously re-elected for three years. The EuroWindoor leadership therefore continues to consist of President Joachim Oberrauch (Division Plastics), Vice-President Helle Carlsen Nielsen (Division Wood), Vice-President Franz Hauk (Division Metal) and unchanged Secretary General Frank Koos. ]]> news-283 Tue, 02 Jan 2018 13:05:00 +0000 EuroWindoor Newsletter 12/2017 http://www.eurowindoor.eu/index.php?id=1104&tx_news_pi1%5Bnews%5D=283&tx_news_pi1%5Bcontroller%5D=News&tx_news_pi1%5Baction%5D=detail&cHash=a3c366fc81aaa990d642e88eff8f3ea0 EuroWindoor AISBL gives an update on its activities in the Newsletter 12/2017. In 2017 we were dedicated again on many items of our working program (Energy Efficiency, Health and Environment, Research and Education and CE-Marking and Standardisation). So EuroWindoor succeeded to bring relevant amendments like the items “daylight” and “healthy buildings” into the political process of the revision the Energy Performance of Buildings Directive. As well for the improvement of standardization for the CPR and for environmental issues (e.g. RoHS II) we keep close contact to the European Commission to support the process. ]]> news-263 Tue, 25 Jul 2017 06:20:00 +0000 EuroWindoor published the Guidance Sheet KB.01: 2017-07 “Power operated Windows” http://www.eurowindoor.eu/index.php?id=1104&tx_news_pi1%5Bnews%5D=263&tx_news_pi1%5Bcontroller%5D=News&tx_news_pi1%5Baction%5D=detail&cHash=2526eb760ed253536e63b47c5fc53422 EuroWindoor adopted in the last Directing Council meeting on July 7th, 2017 in Stockholm the Guidance Sheet KB.01: 2017-07 “Power operated Windows” . EuroWindoor takes account, that building technology relies more and more heavily on power-operated equipment. Power operation causes a higher risk of potential hazards which need to be eliminated by appropriate precautions. This Guidance Sheet supports the manufacturer of windows and provides a code of practice with approaches to technical solutions and information on how to use power-operated windows, aiming to help making window operation safe without major risks. ]]> news-244 Tue, 04 Apr 2017 13:20:00 +0000 EuroWindoor published the Understanding of Specific Technical Documentation (STD) http://www.eurowindoor.eu/index.php?id=1104&tx_news_pi1%5Bnews%5D=244&tx_news_pi1%5Bcontroller%5D=News&tx_news_pi1%5Baction%5D=detail&cHash=0c4856ac795c670b36fe880d3a5c95c2 EuroWindoor adopted in the last Directing Council meeting on March 15th, 2017 in Frankfurt the “Understanding of Specific Technical Documentation (STD)”. The EuroWindoor document is for clarification of questions of interpretation, especially the Specific Technical Documentation (STD) described in Article 37 of the CPR. It points out that requirements of the then required STD are not sufficiently clear and leave significant scope for interpretation. From the perspective of the fenestration industry STDs must only be based on generally accepted documents, accompanied by comprehensible test reports. The table "Scenarios for valid STDs" gives a helpful overview for evaluation. ]]> news-243 Tue, 04 Apr 2017 12:05:00 +0000 EuroWindoor confirmed its strategic working plan http://www.eurowindoor.eu/index.php?id=1104&tx_news_pi1%5Bnews%5D=243&tx_news_pi1%5Bcontroller%5D=News&tx_news_pi1%5Baction%5D=detail&cHash=2456be029f70f9a22ccb3d4bd094a67c EuroWindoor approved in the last Directing Council meeting on March 15th, 2017 in Frankfurt its mission, vision, targets and key activities. EuroWindoor works for its targets consistently to support the European window, door and facade (curtain walling) sector. We are cultivating a strong network for an effective exchange of information by close contact to the EU institutions, standardization organisations and other to the sector connected associations. ]]> news-236 Thu, 22 Dec 2016 13:05:41 +0000 EuroWindoor Newsletter 12/2016 http://www.eurowindoor.eu/index.php?id=1104&tx_news_pi1%5Bnews%5D=236&tx_news_pi1%5Bcontroller%5D=News&tx_news_pi1%5Baction%5D=detail&cHash=5bc5bc49a14bfc9fc24f72858ff7f783 EuroWindoor AISBL gives an update on its activities in the Newsletter 12/2016. In 2016 we worked hard to influence the revision the Energy Performance of Buildings Directive and for improvement of standardization for the CPR. EuroWindoor response to EU winter package: Don´t forget buildings are for people to live in! For more information please download the EuroWindoor AISBL Newsletter 12/2016 or visit the section Position papers and Publications. ]]> news-235 Tue, 20 Dec 2016 08:00:00 +0000 EuroWindoor welcomes “Fachverband der Holzindustrie Österreichs” as a new member association http://www.eurowindoor.eu/index.php?id=1104&tx_news_pi1%5Bnews%5D=235&tx_news_pi1%5Bcontroller%5D=News&tx_news_pi1%5Baction%5D=detail&cHash=fa11aaeb1408fafafc6574cebd663225 Frankfurt am Main, December 20th, 2016. “Fachverband der Holzindustrie Österreichs” has been adopted with beginning of 2017 as a new member association from Austria. “Fachverband der Holzindustrie Österreichs” is an umbrella organisation of all industrial undertakings within the woodworking sector and representing as well window, door and facade manufacturers. With “Fachverband der Holzindustrie Österreichs” EuroWindoor counts now 18 member associations from 13 European countries. ]]> news-232 Wed, 07 Dec 2016 08:00:00 +0000 EuroWindoor will expose at the fair “Bau 2017” in Munich on stand 507 in hall C4 http://www.eurowindoor.eu/index.php?id=1104&tx_news_pi1%5Bnews%5D=232&tx_news_pi1%5Bcontroller%5D=News&tx_news_pi1%5Baction%5D=detail&cHash=cd522db7f004fd2efe13869ed35e19e0 Frankfurt am Main, December 7th, 2016. EuroWindoor is looking forward to welcome all visitors who are interested in its work to bundle the interests of the European window, door and facade (curtain walling) sector. Since its founding on April 28th, 2015 in Brussels EuroWindoor was growing from 11 to 19 members and is in Europe appreciated as a competent and well connected association. There are many actual items to talk about and discuss with you at the fair “Bau 2017” in Munich. EuroWindoor is looking forward to your visit and interesting conversations on stand 507 in hall C4. Please send your suggestion for an appointment in time to gs @eurowindoor .eu. The cheapest and cleanest energy is, no matter what, that unused and EuroWindoor welcome the Commission’s Energy Efficiency First agenda which has been reinforced by the introduction of the Winter package – with e.g. the revision of the Energy Efficiency Directive (EED) and the Energy Performance of Buildings Directive (EPBD). EuroWindoor fully support the proposal from the EU Commission of a binding 30 % energy efficiency target in 2030 instead of today’s non-binding target of 27 percent. EuroWindoor is a strong supporter of the Energy Performance of Buildings Directive (EPBD). Buildings account for about 40 % of the total energy consumption in Europe and EuroWindoor therefore favours constructive improvements that will strengthen the EPBD’s contribution to the EU’s energy and climate goals. With the revised EPBD and the implementation of the existing EPBD EuroWindoor however see a clear missing link. People spend up to 90% of their time in buildings but many existing European buildings suffer from poor daylight and indoor climate with adverse effect on health, learning abilities and productivity. When it comes to un-tapping the potential of buildings and windows EuroWindoor see another missing link, as the EPBD fails to emphasize the importance of windows not only preventing heat loss, but also being providers of energy gains through the windows. Currently, Member States are regulating windows mainly by tightening the U-values (heat loss parameter), thus pushing towards more layers of glazing. However, when the effect of solar gain is left out, the real performance of a window is not reflected and this is not in line with the objectives of sustainable development or giving the right assessment of a window’s real contribution to the performance of a building envelope. ]]> news-223 Fri, 11 Nov 2016 08:00:00 +0000 EuroWindoor AISBL published the Position Paper on principles of good cooperation and improvement of effectiveness of standardization for CPR http://www.eurowindoor.eu/index.php?id=1104&tx_news_pi1%5Bnews%5D=223&tx_news_pi1%5Bcontroller%5D=News&tx_news_pi1%5Baction%5D=detail&cHash=847f0cbc613752e9c9cfaf40ca0b461e Frankfurt am Main, November 11th, 2016. EuroWindoor AISBL published the position on Improvement of standardization for CPR as a starting point for discussion with different actors in the standardisation process and as input to the ongoing discussions in different groups related to the standardization for CPR. EuroWindoor members see the need of more detailed input and permanent communication during the whole process between CEN/TC, CCMC, European Commission (EC) and Member States (MS). Otherwise standards for harmonisation will always be delayed and problems with the citation of hEN will appear again and again. ]]> news-221 Wed, 09 Nov 2016 08:00:00 +0000 EuroWindoor AISBL published the Infographic on Energy balance based window replacement requirements in EU Member States http://www.eurowindoor.eu/index.php?id=1104&tx_news_pi1%5Bnews%5D=221&tx_news_pi1%5Bcontroller%5D=News&tx_news_pi1%5Baction%5D=detail&cHash=f5cb665016fea94efe594d63d3a65c4a Frankfurt am Main, November 9th, 2016. EuroWindoor AISBL as a strong supporter of the EPBD requires using the energy balance approach to assess the energy performance of windows. EuroWindoors infographic shows that energy balance based window replacement requirements are only implemented in a few EU Member States. The energy balance approach considers beside the U-Value (heat loss) as well the g-value (solar gains). The solar gains must be considered in the revision of the EPBD also for replacement. ]]> news-220 Tue, 08 Nov 2016 23:00:00 +0000 EuroWindoor AISBL published the Joint Position Paper Revising the Energy Performance of Buildings Directive to tap into the energy saving potential of modern windows http://www.eurowindoor.eu/index.php?id=1104&tx_news_pi1%5Bnews%5D=220&tx_news_pi1%5Bcontroller%5D=News&tx_news_pi1%5Baction%5D=detail&cHash=5860f36c84cf5a1387090e283657998f Frankfurt am Main, November 9th, 2016. EuroWindoor AISBL joins strong industry position supporting to call for a modernised EPBD to unleash the energy savings potential of high performing windows. ]]> news-212 Tue, 20 Sep 2016 07:15:00 +0000 EuroWindoor AISBL published the Information „REACH - fast facts“ to inform about the REACH Regulation http://www.eurowindoor.eu/index.php?id=1104&tx_news_pi1%5Bnews%5D=212&tx_news_pi1%5Bcontroller%5D=News&tx_news_pi1%5Baction%5D=detail&cHash=caa33b339fcaf78d9637f1a88bc95ee0 Frankfurt am Main, September 20th, 2016. EuroWindoor published the Information “REACH – fast facts” with the aim to support the manufacturer of windows, doors and facades (curtain walling) and their suppliers with an overview to the REACH Regulation in general. In 2015 the European court of justice made a clarification to the EU regulation which is for Registration, Evaluation, Authorisation and Restriction of Chemicals (REACH). The European court of justice skipped the previous opinion on Art. 33 from ECHA and decided that declaration of single articles (e.g. for a profile) has to be “forwarded” with the article made of articles (e.g. window). The previous interpretation of the REACH declaration for an article made of articles is no longer applicable. EuroWindoor decided in the Directing Council meeting on July 6th, 2016 in Amsterdam to publish the information “REACH – fast facts” which has been elaborated on basis of a proposal from the German member associations VFF and BF. Beside a general overview on REACH the focus of the document is on duties and recommendations for downstream users. ]]> news-204 Thu, 01 Sep 2016 14:19:23 +0000 EuroWindoor AISBL Newsletter 08/2016 http://www.eurowindoor.eu/index.php?id=1104&tx_news_pi1%5Bnews%5D=204&tx_news_pi1%5Bcontroller%5D=News&tx_news_pi1%5Baction%5D=detail&cHash=48102ec3f241034f047ad56785600770 The EuroWindoor AISBL Newsletter 08/2016 is available for download. For more information please download the EuroWindoor AISBL Newsletter 08/2016 or visit the section Position papers and Publications. ]]> news-196 Tue, 07 Jun 2016 10:03:00 +0000 EuroWindoor´s first Timber Study Tour to Finland took place from May 18th – 20th, 2016. http://www.eurowindoor.eu/index.php?id=1104&tx_news_pi1%5Bnews%5D=196&tx_news_pi1%5Bcontroller%5D=News&tx_news_pi1%5Baction%5D=detail&cHash=176064f55edf6b9ae3499c2f91c1fae3 Frankfurt am Main, June 7th, 2016. The Timber Study Tour through the Southwest of Finland was organized in the tradition of the FEMIB study tours and gave the 27 participants from seven European countries varied insights into the Finnish window and timber industry. Furthermore, the study tour was aimed to establish new contacts and to contribute as well the improved cooperation of European companies in the sector. The starting point of the tour was the Hotel Scandic Rosendahl in Tampere, in which the participants met after their arrival on Wednesday, May 18th, 2016. The visit of the restaurant in an observation tower about 140 m over Tampere with breath-taking view offered the participants the first opportunity to get to knowledge each other. The participants visited on Thursday first the production of Inwido Ruovesi window manufacturer in Ruovesi. A counterpoint set the visit to the nearby Serlachius Art Museum Gösta, whose 2014-opened extension in timber construction attracted international attention. On the way back to Tampere, the participants visited the sawmill Metsä Vilppula. The ultramodern sawmill was optimized in 2013 and impresses with high performance and low level of offcuts. On Friday, the group visited the production of Lammin Ikkunat window manufacturer on the way to Helsinki. Beside the modern production, a test equipment for developing solutions to overcome the shielding of mobile radiation by low-e coating in modern buildings was shown. Finally, the visit of a window installation of Skaala Production Oy in a building complex near the airport of Helsinki was on the itinerary. The "Federation of the Finnish Woodworking Industries" hosted the Tour. The company visits were only possible by the close contacts of this member association of EuroWindoor AISBL. Most of the participants were delighted about the impacts they got by this Timber Study Tour and asked for the next tour in 2018! ]]> news-189 Tue, 26 Apr 2016 13:15:00 +0000 EuroWindoor AISBL published the position paper „The benefits of windows and glazed areas“ and the Infographic “Windows for healthier buildings” as a contribution to the revision of the Energy Performance of Buildings Directive (EPBD) http://www.eurowindoor.eu/index.php?id=1104&tx_news_pi1%5Bnews%5D=189&tx_news_pi1%5Bcontroller%5D=News&tx_news_pi1%5Baction%5D=detail&cHash=36008ab2e47681aef21ec3a6b5f36144 Frankfurt am Main, April 26th, 2016. EuroWindoor AISBL as a strong supporter of the EPBD favours constructive improvements that will strengthen the EPBD’s contribution to the EU’s energy and climate goals. The energy, health and comfort benefits of windows should be further included and implemented in the revised Energy Performance of Buildings Directive. EuroWindoor AISBLs comprehensive reply to the Commission’s consultation on the review of the Energy Performance of Buildings Directive (October 2015) EuroWindoor highlighted how windows are contributing to the overall energy performance of buildings and to the general comfort and well-being of people living and working in these buildings. In order to better harvest these opportunities EuroWindoor considers that the revision of the EPBD is an opportunity to better recognise the crucial role windows play in terms of daylight, indoor climate and energy efficiency. The rate of building renovation is too low: below 1.2% per year! Triggering renovations in Europe is key in obtaining large energy use reductions in our buildings, and the replacement of windows plays a crucialrole in achieving this goal. A study from Fraunhofer (IBP) 2015, states that around 80 million Europeans live in damp or unhealthy buildings, which has a great impact of the health and well-being. Why only regulating one part of a window’s function while leaving the contributing part of solar gain out? In addition to their insulation properties, windows provide free solar heat gains to buildings. ]]> news-186 Fri, 15 Apr 2016 14:07:00 +0000 EuroWindoor welcomes AGORIA as a new member association http://www.eurowindoor.eu/index.php?id=1104&tx_news_pi1%5Bnews%5D=186&tx_news_pi1%5Bcontroller%5D=News&tx_news_pi1%5Baction%5D=detail&cHash=52c273f81ccaf6f5f0b65216ff115dcc AGORIA has been adopted as a new member association of EuroWindoor. Agoria is the largest sectoral employers federation in Belgium and is defending the interests of companies in the technology industry. AGORIA's Business Community Building Technology is representing window, door and facade manufacturers linked to all materials. With AGORIA EuroWindoor counts now 17 member associations from 12 European countries. ]]> news-177 Thu, 17 Mar 2016 08:43:00 +0000 EuroWindoor grows to 16 member associations http://www.eurowindoor.eu/index.php?id=1104&tx_news_pi1%5Bnews%5D=177&tx_news_pi1%5Bcontroller%5D=News&tx_news_pi1%5Baction%5D=detail&cHash=aa488d2d267534e07f3f7bcdbdb86bc6 ANFAJE from Portugal and Assovetro from Italy join EuroWindoor AISBL. EuroWindoor's Directing Council admitted ANFAJE - Associação Nacional dos Fabricantes de Janelas Eficientes from Portugal and Assovetro, Associazione Nazionale degli Industriali del Vetro from Italy as new members during the meeting on March 15th, 2016 in Nuremberg. EuroWindoor counts now 16 member assoiations. The new Deadline for registration is now: March 29th, 2016. For questions regarding the journey please contact Markus Christoffel from the EuroWindoor General Secretariat in Frankfurt am Main. You reach him by phone +49 69 955054-36 or email gs @eurowindoor .eu. ]]> news-169 Tue, 16 Feb 2016 12:23:00 +0000 EuroWindoor AISBL: Timber Study Tour to Finland May 18th to 20th, 2016. http://www.eurowindoor.eu/index.php?id=1104&tx_news_pi1%5Bnews%5D=169&tx_news_pi1%5Bcontroller%5D=News&tx_news_pi1%5Baction%5D=detail&cHash=4a8f3c59f91f2d9ceaa618c3d5365e0c Frankfurt am Main, January 20th, 2016. In 2016 Finland will be the destination of the 1st EuroWindoor Timber Study Tour. We offer you interesting company visits and an attractive social program. So EuroWindoor keeps the tradition of FEMIB to organize a study tour in the frame of the division “wood”. The Members of FEMIB (Federation of the European Building Joinery Associations) are continuing their activities in EuroWindoor. The study tour goes through Finland´s Southwest, visiting two window factories, a state-of-the-art sawmill and other attractions such as a museum with a spectacular award winning timber-frame extension. The tour starts in Tampere and finishes two days later in Helsinki. The Timber Study tour price is 680 Euro per participant. Members of the EuroWindoor Partners pay only 575 Euro per participant. The price per accompanying person using Double room is 375 Euro. This includes besides the tour program two accommodations at the hotel including breakfast and the meals as specified in the program together with a Finnish barbecue at a lake (dependent on the weather). The Deadline for registration is shifted to March 29th, 2016. ]]> news-162 Fri, 22 Jan 2016 14:51:00 +0000 EuroWindoor published the Guidance Sheet CE.03: 2015-12 http://www.eurowindoor.eu/index.php?id=1104&tx_news_pi1%5Bnews%5D=162&tx_news_pi1%5Bcontroller%5D=News&tx_news_pi1%5Baction%5D=detail&cHash=3a96b6b50ba4114b44d9ced9c086f6cc EuroWindoor published in cooperation with European Aluminium and ift Rosenheim the Guidance Sheet CE.03: 2015-12 “Declaration of Performance and CE-Marking of Windows and Pedestrian Doorsets with fire resistance and/or smoke control characteristics according to EN 16034”. For more information and for download of the document view the section "CE-Marking"
]]> news-161 Wed, 20 Jan 2016 08:26:00 +0000 EuroWindoor organizes the Timber Study Tour 2016 on May 18- 20th, 2016 in Finland http://www.eurowindoor.eu/index.php?id=1104&tx_news_pi1%5Bnews%5D=161&tx_news_pi1%5Bcontroller%5D=News&tx_news_pi1%5Baction%5D=detail&cHash=0911c6aa6e6e513ffde59562bd7700a3 EuroWindoor offers in its Timber Study Tour 2016 interesting company visits (window manufacturers, saw mill, window installation etc.) and factful information events will allow deeper views in the process and progress inside the Finnish industry. For more information about the Timber Study Tour 2016 and its history please view the section "Study Tour" of the activity "Research and Education"
]]> news-160 Wed, 20 Jan 2016 07:53:00 +0000 EuroWindoor runs up to 14 association members http://www.eurowindoor.eu/index.php?id=1104&tx_news_pi1%5Bnews%5D=160&tx_news_pi1%5Bcontroller%5D=News&tx_news_pi1%5Baction%5D=detail&cHash=6b65f1b1f3d89c4f86717c2b95b75bd0 EuroWindoor admitted two new members: Glass og Fasadeforeningen from Norway and Ceská komora LOP (Czech Chamber of light envelope of buildings) from Czech Republic. Assovetro from Italy sent the application for membership. ]]> news-158 Tue, 19 Jan 2016 09:57:00 +0000 EuroWindoor applied the exemption to the RoHS II directive http://www.eurowindoor.eu/index.php?id=1104&tx_news_pi1%5Bnews%5D=158&tx_news_pi1%5Bcontroller%5D=News&tx_news_pi1%5Baction%5D=detail&cHash=248da69dc8f92ee9ac62158ff3580e26 EuroWindoor applied in cooperation with EPPA an exemption to the RoHS II directive for using recycled PVC for windows and doors profiles. Please find more information in section RoHS2 of "Health and Environment"
]]> news-139 Thu, 29 Oct 2015 08:52:00 +0000 EuroWindoor follow up on Consultation Forum 30/9 2015 and Ecofys study http://www.eurowindoor.eu/index.php?id=1104&tx_news_pi1%5Bnews%5D=139&tx_news_pi1%5Bcontroller%5D=News&tx_news_pi1%5Baction%5D=detail&cHash=5d95d6f866c07c0461097f4342377e06 EuroWindoor followed up on Consultation Forum of the Ecodesign Directive (2009/125/EC) on window products (30/9 2015) and send additional remarks with the new Ecofys study “The current proposal for an energy label for windows - Brief Analysis of Pros and Cons” as annex. ]]> news-137 Thu, 22 Oct 2015 15:05:00 +0000 EuroWindoor reply to the EPBD Public Consultation questionnaire http://www.eurowindoor.eu/index.php?id=1104&tx_news_pi1%5Bnews%5D=137&tx_news_pi1%5Bcontroller%5D=News&tx_news_pi1%5Baction%5D=detail&cHash=bd526e331a9d1a2893e4d65933f0f5f1 EuroWindoor replied to the public consultation on the evaluation of the Energy Performance of Buildings Directive (EPBD) with proposals for improvements of the EPBD to raise energy efficiency in the building sector. ]]> news-132 Wed, 16 Sep 2015 08:28:00 +0000 EuroWindoor AISBL association founded http://www.eurowindoor.eu/index.php?id=1104&tx_news_pi1%5Bnews%5D=132&tx_news_pi1%5Bcontroller%5D=News&tx_news_pi1%5Baction%5D=detail&cHash=ca3b7a66fec79f3564c09dbd81659790 A new European association representing the interests of the European window, door and facade industry has been founded. EuroWindoor AISBL received official accreditation on 10 August 2015 by Royal Decree in Belgium and is now a fully formalised and legally operating association. EuroWindoor AISBL will primarily seek to address EU institutions on key issues related to windows, doors and facades. 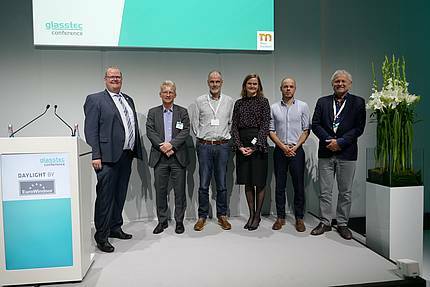 Ten national associations representing manufacturers and one European Company are the founders of the new association that represents window, door and facade manufacturers in Europe. The companies behind the associations have sales activities all over Europe, and are prominent in the market, interacting with dealers, installers and consumers buying windows and doors. “Establishing a single independent building materials association, thereby bundling interests, with an efficient structure means that we can effectively represent the window, door and facade industry in Europe,” explains Joachim Oberrauch, President of EuroWindoor AISBL. The association has already established itself within two key legislative frameworks, the “EU energy labelling of windows” and the “RoHS II Directive”. Though EuroWindoor is a strong proponent of energy-efficient measures applicable throughout Europe, the association is unable to back the proposed EU Energy labelling for windows. Windows are very specific products that are already regulated at national level. In addition, the energy performance of windows depends on a variety of different factors such as different climate conditions (even within countries), orientation and varying building regulations. In line with the Energy Performance of Buildings Directive (EPBD), Member states are already responsible for defining cost-optimal energy performance requirements for buildings and components, and CE marking for windows is already in place. Finally, no clear link between the introduction of EU Energy labelling and energy savings has been documented by the European Commission. Such an EU Energy label would often not be effective in guiding consumers towards the most energy- and cost-optimal products across Europe and would be highly unlikely to deliver the benefits expected from its introduction. Since July 2011, the RoHS II Directive has been a legal EU Directive that restricts the use of hazardous substances like lead, chrome (VI) or cadmium in electrical and electronic equipment. From 2019, it will also apply to windows and doors with electrical device. From EuroWindoors point of view, the main problem is that the Directive applies the requirement to the whole window rather than just the electrical components; EuroWindoor is urging it should be restricted to those electrical parts. Furthermore, EuroWindoor criticises the unduly short transition period and insufficient consensus with other similar directives. EuroWindoor was founded on 28 April 2015 in Brussels and began operation in Copenhagen on 1 July 2015, when the Directing Council and the General Assembly met for the first time. In addition to agreeing on two position papers, EuroWindoor AISBL adopted its working programme to represent the interests of the European window, door and facade (curtain walling) sector. National Associations of the European window, door and facade sector and the European association of its supplying industries and companies from Europe can become member. The former organisation EuroWindoor, a cooperative alliance of the European materials-dependent associations FAECF, FEMIB, EPW and UEMV, has been formally terminated, and the associations EPW and FEMIB have formally stopped their past activities to commit them to EuroWindoor. AISBL stands for „Association internationale sans but lucratif“ – Association Without Lucrative Purpose – an international non-profit association. Two new members (BF Bundesverband Flachglas from Troisdorf, Germany and VKG Vereniging Kunststof Gevelelementenindustrie from Nieuwegein, Netherlands) were admitted in Copenhagen.